If you missed the series finale of How I Met Your Mother, be glad. By most counts, it was terrible ending to a delightful show. If you were one of the millions of fans that shifted your calendar to actually watch it in real-time, not on your DVR or one the web the next day, chances are you are trying to drown your frustrations with a bit of media therapy. While retail therapy is quite well known, initially developed on Rodeo Drive in Beverly Hills, media therapy is now coming into it’s own. Typically media therapy involves binge watching of some known good series in an attempt to erase the residual trauma caused by a story gone wrong. While retail therapy fills your closet while emptying your bank account in an effort to assuage trauma, media therapy requires, traditionally, an uninterrupted block of hours dedicated to quality time between you and your television. In the past Binge Watching was limited to Star Trek Marathons on SyFy channel or Leave It To Beaver reruns on TV Land. The rapid availability of content online through Netflix, Hulu and the like, means that effective media therapy prescriptions are available en masse and at your fingertips, literally. In our attempt to deconstruct the neural connections burned into our cerebral cortex by Mother’s finale, we began to ponder how to receive our media therapy on the go, through our smartphones. Argus Insights took a look as which handsets are best for grabbing a few idle minutes into a few soothing minutes of Downtown Abby or Breaking Bad. 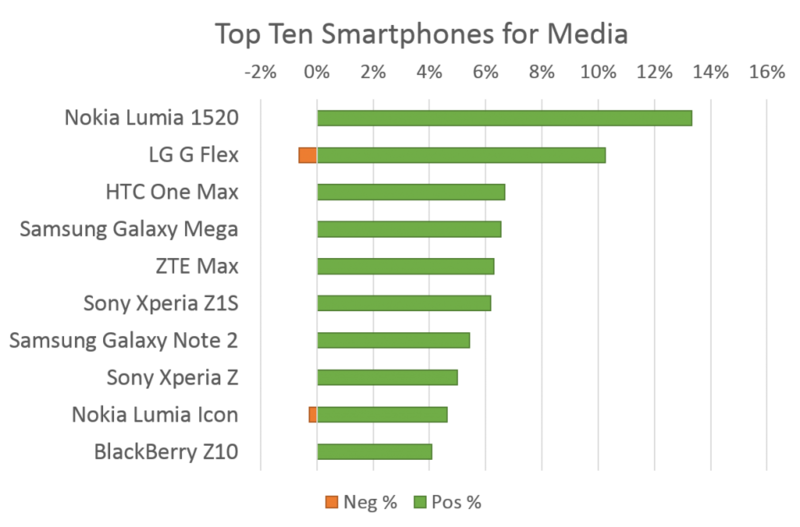 The graph shows that, for example, the LG G Flex has more than 10% of its consumers expressing satisfaction with less than 1% expressing negative opinions when it comes to the media related usage on their smartphone. It is worth noting that Apple’s 5S and 5C are not on the top ten but they did crack the top twenty. It’s surprising that even though they don’t feature large screens compared to the increasing average size of smartphones year by year, consumers still expressed enough positivity for them to rank in at 19th and 20th respectively. Also, Apple smartphone users are also likely to have Apple iPads which are much more enjoyable to watch movies and videos on. It wasn’t surprising to see that our data found the Nokia Lumia 1520 to be the best phone for media usage. The Lumia 1520 has one of the largest displays available coming in at 6” with 367 pixels packed in per square inch and powered by Qualcomm’s Snapdragon 800 processor. These specs help the Lumia 1520 produce stunning and smooth visuals. Having strong specs within these three areas turns your smartphone into the ideal personal portable home theater system. This allows you to turn your breaks or bus rides into YouTube video sessions or catching up on your favorite movies or television shows. These three key components are not heavily guarded secret and other manufacturers are following suit with large screens, crisp high definition displays, and fast processors to enable satisfying viewing pleasure. The same formula can also be seen in the other 9 smartphones on this list. With the exception of the BlackBerry Z10, which features a 4.2” screen, the rest of the smartphones have screens larger than 5”. Along with a large screen, all the smartphones on this list have superior screen resolution and technology. High quality AMOLED displays, LCD displays and IPS (In-Plane Switching) displays simply delight users with high pixel count and clear images. For all the movie junkies out there looking for the smartphone that has all the right components for the best possible media experience, these ten deserve a strong consideration. In today’s market, there isn’t a shortage of large screen smartphones to choose. Take advantage of the variety, use the time to discover what you want most out of your smartphone, and see which of these ten fits your checklist most. As always, watch for Argus Insights, we have the tools to find what delights consumers most by simply listening to you, the people.